Jetsün Taranatha. Courtesy of Shechen Monastery. History of Buddhism in India (Tib. རྒྱ་གར་ཆོས་བྱུང་, gyagar chöjung; Wyl. rgya gar chos 'byung) is a text composed in 1608 by the great Jonang master Jetsün Taranatha. 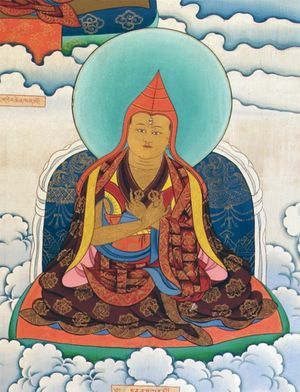 It is, together with Gö Lotsawa’s Blue Annals and Butön Rinchen Drup’s History of Buddhism, the main Tibetan reference on the history of Buddhism, particularly the Hinayana and Sutra Mahayana teachings, in its land of orgin from the time of the Buddha until its disappearance in the 13th century. Taranatha, History of Buddhism in India, Transl. Lama Chimpa and Alaka Chattopadhyaya, Motilal Barnasidass, Delhi: 1970, 2004. This page was last edited on 31 January 2017, at 20:40.